Summer school can be very stressful – a whole semester crammed into a month. So how can you cope? Falvey is here for you. While not open as long as the hours in a regular semester, the Library is open Monday through Thursday 8 am – 8 pm, Friday 8 am – 5 pm, Saturday and Sunday noon – 5 pm. To check library hours click here. The Math Learning Resource Center (MLRC) and Writing Center are both open during summer school. MLRC’s summer hours (through July 26) are 1 – 5 pm, Monday – Thursday; the Writing Center’s summer hours (through July 26) are 11:30 – 4:30, Monday – Thursday. Research support librarians are available for consultation when the Library is open; they may be contacted by telephone (610-519-4270), text (610-816-2222) or by appointment. They are also available for walk-in assistance. Falvey’s “Help” page maintains a list of “Frequently Asked Questions,” which may have just the answers you need: how to find a book, how to renew a book online, course reserves and more. “Help” is accessed from the library’s homepage. Falvey offers 80 public workstations and a variety of study spaces. The first floor houses the 24/7 “Holy Grounds” and a variety of seating choices in the main room. The Learning Commons on the second floor also provides numerous study spaces. Even quieter are the third and fourth floors which have tables and chairs, carrels, the Kolmer Group Study Rooms and cozy lounges near the back stairwells. The Dugan Polk Family Reading Room is a spectacular 24 hour quiet study space in Old Falvey; it houses the recently restored masterpiece, “The Triumph of David,” attributed to Pietro da Cortona. The lobby outside the Reading Room is another comfortably furnished study space. 24/7 access will remain in effect for summer 2018. 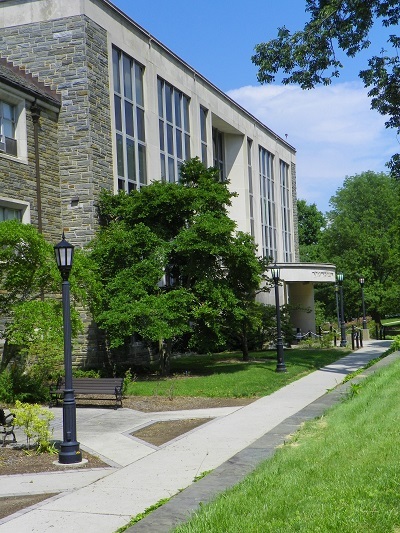 Villanova students, faculty and staff with valid Wildcards will still be able to access the Dugan Polk Family Reading Room, the first floor lounge and the ground, first, and second floors after-hours. And a few words of advice from one who has been there (more than once!) – do not procrastinate and do not skip classes. Summer school is hectic, but it is possible to do well. And remember, Falvey librarians and staff are here for you! Falvey photograph by Alice Bampton, Communication and Marketing Department. Blog originally published by Bampton on July 11, 2017.